Norman Rockwell Norman Percevel Rockwell was born on February 3, 1894, in a Manhattan brownstone. His father was a New York City textile company executive who sometimes copied drawings for his own amusement. His mother was a chronic invalid whose father was an artist sometimes reduced to house painting. There were two children; the elder son Jarvis, a strapping athlete, and Norman, who was small for his age and had to wear eyeglasses and corrective shoes. In 1902, the Rockwells moved from New York City to suburban Mamaroneck. Rockwell liked the country better than the city and this preference formed the basics for his later paintings. By the time he was 14 he was taking art lessons. He dropped out of high school in the middle of his sophomore year to attend the National Academy of Design full time. At the tender age of 19 he was appointed the art director of Boy's Life Magazine. On May 20,1916 Rockwell did the first of his 322 Saturday Evening Post covers. This brought Rockwell into the big time and that is where he stayed for the next half century. Norman Rockwell settled into Arlington, Vermont in 1939 and started to produce some of his most famous work. Oddly enough, four other illustrators for the Saturday Evening Post lived in that village of 1600 people, and there was a close bond between them. During this period Rockwell began to work more from photographs. In the area around Arlington he found many willing models for his paintings. In The Tattooist, Rockwell used one of his fellow illustrators, Mead Schaeffer as the tattooist and a neighbor, Clarence Decker, as the sailor. This was Schaeffer's only appearance as a central figure in a Rockwell illustration. Decker was Master of the Grange in Arlington and shows up in quite a few other Rockwell illustrations. The Post covers his better known work but he produced many more illustrations. He completed covers for Literary Digest, Life, and The Country Gentleman. He did ad work for companies like AT&T, Campbell Soup, Coca-Cola, and Ford Motor Company but to name a few. His other work included movie promotional booklets, Top Value Stamp catalogs, murals, posters, sheet music, six United States postage stamps and an album cover for Mike Bloomfield and Al Kooper. He was a busy man! Norman Rockwell's art has a distinct American flavor. His characters are the people who live in everyone's hometown. Rockwell died in 1978 at his home in Stockbridge, Massachusetts. On his easel was an unfinished painting of a Christian missionary trying to convert a Stockbridge Indian chief. Norman Rockwell once said, "No picture ever really satisfies me. If you become satisfied with your work, you are through! I dream that every picture I start is going to be a wonderful one. In my mind it has infinite possibilities, but as I go on painting and am forced to face realities the dream begins to fade and I realize it is going to be just another picture. Then comes the time when I have to call on all my character and resolution to go ahead with the painting. Finally, if all goes well, toward the end a small part of the hope for a good picture returns and I finish it. But the finished job is never up to the dream at the start. If, in the course of a year, I have done three pictures of which I am at all proud, I have had a pretty good year." Rockwell worked from various photographs while painting The Tattooist, which was used as The Post cover on the March 4, 1944 issue. In fact, Rockwell used photographs as an aid in doing most of his paintings. 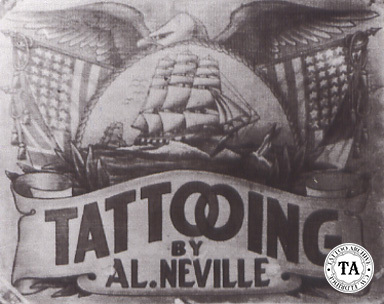 For The Tattooist, Rockwell borrowed a tattoo machine from the Bowery tattooist Al Neville. Tattoo shop signs seen here is from the Rockwell collection. Rockwell obviously consulted with Al Neville along with former sailors to insure accuracy in his painting of The Tattooist. 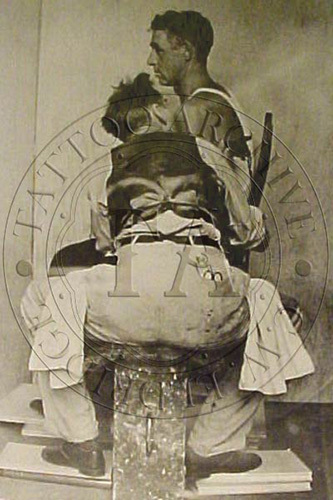 An interesting sidelight to the painting of the Tattooist: The Tattoo Archive recently received an email from Ross Mosher who is the great, great nephew of Clarence Decker, the model for the Tattooist. The email read, "Clarence didn't have a single tattoo in real life. Also, the last name on his arm is Betty, that's because my great, great aunt Bell told Norman that if he put her name in the painting she wouldn't speak to him again. So Norman crossed the L's and added a Y."